Blog posts : "light show"
Here are a few teaser clips from our latest LED light dance and projection show. Enjoy! I got to take my new Supernova LED poi out for the first time on Saturday night, and wow, these things shine! Just in time for the holiday season.. presenting our new LED Glowing Snow Fairy! Fire Pixie was selected to showcase our LED dancers at the Ises NCC Gala Ball last week at Fort Mason Center in San Francisco. 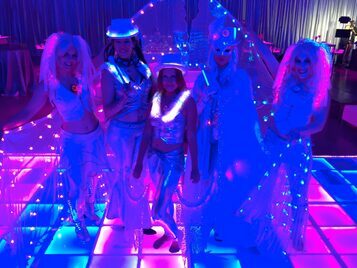 We pulled out all the stops and brought 6 performers to the event, completely decked out from head to toe in LED lights. Check out Mermaid Glimmer's newest video! Our New Year's Eve LED Light show at the India Community Center in Milpitas, CA went off without a hitch. It's wintertime, and the weather is iffy, so we find ourselves doing a lot of light shows this time of year. Light shows can be done indoors, so, no worrying about fire permits or ventilation, and they're fun to watch and pretty mesmerizing. Yesterday I had a pretty unusual show - it was a blacklight / glow light show for kids at a summer camp at Club Sport in Fremont. The summer camp theme was centered around the decades of the 20th century, and for a blacklight show, I was assigned the 1970s.